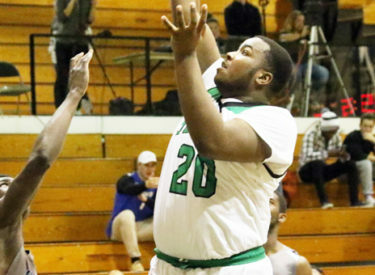 It wasn’t pretty, but at this point in time, the Seward County Saints are done worrying about that as the guys in green pulled out a one point, 67-66 win Saturday night at home in the Greenhouse to snap a mini three game skid that because of the break lasted an agonizing five weeks. It was a slow start for both teams, a sign of things to come, as Colby jumped out to a 6-0 lead to start the game, but didn’t score again for over three minutes, while it took the Saints nearly four minutes to pick up their first field goal in a 6-4 game. Points continued to be tough to come by as Colby slowly pushed their lead to 13-6 midway through the half when Charles Beauregard took it to the rack for just Seward’s second field goal of the game at the 11:00 mark of the first. A Trojan three with 8:53 to go in the half put Colby up 10 but slowly the Saints crept back in, getting a boost from their bench and Deionta Nunnally who scored five straight to cut the Colby lead in half to 21-16. Beauregard took over from there for Seward, scoring nine straight Seward points to knot the score at 27 before Tre Kidd got a last second tip in at the first half buzzer to wrap up a 13-4 Saints run into the locker rooms to give them a 29-27 lead at the break. The halftime numbers as expected weren’t something to write home about for either side as Seward shot just 33% and Colby 36% while the two combined to go just 5 for 23 from beyond the arc. Beauregard and big man Martavious Wilson did the bulk of the work for the Saints, combining for 22 of the Saints 29 first half points. The pace picked up some as the second half began with Seward stretching their lead to five at 36-31 on a midrange jumper from Kidd early on. A drive and score from Ernest Carter in the lane and another bucket from Nunnally pushed the Seward lead to six later on and back to back threes from Beauregard made it a seven point game, 54-47 with 9:37 remaining. A scrappy Colby club fought back to take a lead of their own at 56-55, but that didn’t last long as Kidd swished home a three from the corner out of a timeout to put the Saints back up 58-56. After Colby tied the score again, Kidd struck again, hitting his second three of the game and assisting on a triple from Malik Brown to make it 64-58 Saints. Moments later, Kidd swished home another long ball, putting the Saints up seven and it ended up being the game winner as Seward failed to score again, but came up with enough defense to hang on in the end 67-66 to snap their three game losing streak. Seward held on for the one point win despite shooting just 44% in the game and turning the ball over 23 times on the night. The key stat on the positive side for Seward was a rare one as the Saints outrebounded Colby by nine and grabbed 13 offensive rebounds, turning those into 12 second chance points in the win. Beauregard led Seward with a season high 28 and also grabbed a team best seven rebounds in the win. Kidd came up big off the bench for Seward, scoring a career best 13 including 3 for 3 from downtown while Nunnally added seven on 3 of 6 from the field. The Saints earn a much needed win to improve to 6-9 overall and 3-8 in conference play on the year while Colby falls to 6-9 and 2-9 in league action. Seward will return to the court Wednesday when they host Dodge City in the Greenhouse in an 8:00 tip.